Good day, Greg, I hope you’re feeling at least a little better after all those events… I have a few questions. First, is there a way to prioritize between two fluid inputs without using Aluminium covers? For example, I’d like my boilers to prioritize using Distilled Water returned from turbines and engines, and only then take it from the external tank. I’ve tried using the setup with two barrels on top of each other, but unfortunately it didn’t work. If possible, I’d like to avoid making a separate pipe from turbines/engines all the way to the main tank. Second, what exactly Fluid-o-Meter shows when the value is too large to fit on its display (when it is connected to a 3x3x3 tank)? Third, I’m not sure if this is a bug or not, but Hoppers don’t seem to respect their output stacksize limit when outputing to another hopper - a single pulse of 0 signal will make it output its whole contents. 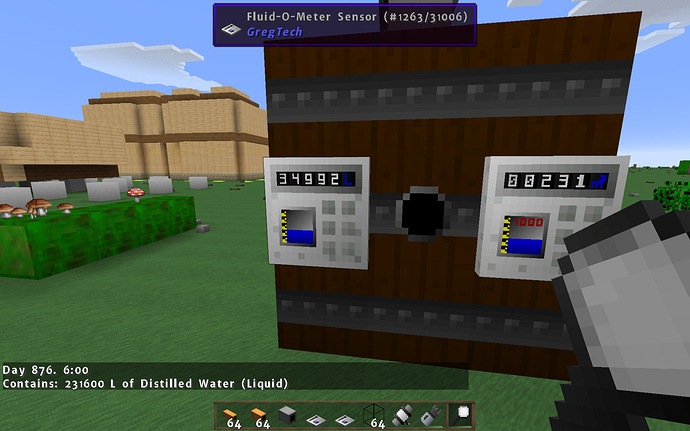 If I’ll make it output to the chest instead, it outputs the correct amount. And yes, the hopper was set to the exact stacksize. And my fourth question is about Custom Gearboxes. Are they 100% effficient, or do they have some loss due to friction? Because I’m trying a simple setup where I’m trying to power two Mixers with one turbine (for the Sulfuric Acid production). From my understanding it should work, but doesn’t. So, if divided by half, it should be enough to power two 16 GU/t recipes. The Steam Turbine is facing upwards and is connected to a Custom Bronze Gearbox with vertical internal axle, and with gears on the bottom and right. To the right of that Gearbox is another one with gears on its left and top. Finally, on top of both Gearboxes are two mixers. When I try to power this setup, I start to hear constant “I BROKE” sounds from both mixers, as if they are not getting enough power. Both of them are using 16 GU/t recipes. Speaking of which, it would be great to have a way to measure the current output of RU/KU from the turbine/engine :). There was a Setup using Fluid Extenders that did that. Heck Bear found that Setup for some reason somehow. it involved 1 Fluid Extender and one extra Fluid Pipe as far as I remember. Maybe try experimenting that out. Third, I’m not sure if this is a bug or not, but Hoppers don’t seem to respect their output stacksize limit when outputting to another hopper - a single pulse of 0 signal will make it output its whole contents. If I’ll make it output to the chest instead, it outputs the correct amount. And yes, the hopper was set to the exact stacksize. It will emit bundles of that exact stacksize, and it will do it once if you only give it a short Redstone pulse. If the Redstone is too long you will end up with the Hopper dumping itself. Also if you do Hopper->Hopper do NOT vertically stack the hoppers! Otherwise the lower Hopper will just empty the top hopper instantly. All Gearboxes are Lossless during normal operation. Unsure about your Setup though, are you sure it gets enough Steam? Also if you do Hopper->Hopper do NOT vertically stack the hoppers! Ah, I see, so that’s what happened! I didn’t even think about bottom hopper snatching items from the top one… Thanks! Unsure about your Setup though, are you sure it gets enough Steam? From my understanding, it should - the pressure on boilers is not increasing, so all the Steam should go into Turbine. Bronze Pipe has a bandwidth of 450 L/t, which should be enough. Even if I replace the basic Invar BB + Boiler with the Steel versions, which pushes Steam production to the Turbine’s hard upper limit, the problem still persists. As for the Turbine, it outputs the right amount, according to its Tooltip, right? remember it scales with the input ofcourse. … wow, for some reason I’ve completely missed the possibility of it using UInt16… Thanks, that clears that up! remember it scales with the input ofcourse. Yes, I’ve mentioned it in my calculations. The turbine tooltip states that it converts 96 S/t to 32 RU/t, so the conversion ratio is 3:1. Which means that if I input 160 S/t, it should output 53 RU/t (or 35.2 RU/t, if we apply 66% efficiency). I’d also like to mention that they make the IBROKE sound once each ~5 ticks. If I increase the amount of RU/t I give to Gearboxes, the sound starts going off each tick. Does the Gearbox itself go to two different output targets? because it would do that in that case. Well, yes. The turbine is connected to a Gearbox, one side of which is connected to one machine, the other connected with another Gearbox, which in turn is connected to a second machine. Yeah you cant power two Machines at the same time with one Turbine unless you split it into 4 RU Packets using a Planetary Gearbox, in which case you need a bigger Turbine. For your Setup you always have to disconnect the Gearboxes entirely or else it will alternate between one direction and the other. Aw, I see. Thanks for answering my questions!